While there has been horse racing in Britain since the 12th century, it did not become a professional sport until 1711, when Queen Anne founded Ascot. It was not until 1750 that the national Jockey Club was formed. Kempton Park remains one of the best known racecourses in the country. It was the brainchild of SH Hydge, a 19th century businessman and Tory Party electoral agent. He bought Kempton Manor and its park in 1872 and by July 1878 had developed the park into a racecourse. It was aimed at upmarket racegoers, particularly women, and Hyde hoped it would enjoy the success of nearby Sandown Park. 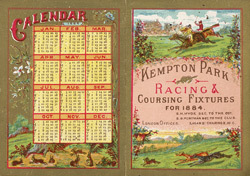 In 1879 a railway station was opened at Kempton to encourage people to attend race meetings there. Kempton Park was used as a prisoner-of-war camp between 1939 and 1946. Racing resumed in 1947.